Polycrete’s engineering and manufacturing folks have come up with two more advancements that will make it easier for you to design and build energy efficient structures that stand up to Mother Nature. I don’t know which of these is the bigger deal. A few months ago we told you that size really does matter and announced that we can now make Big Block wide enough to accommodate up to 24" of concrete. Well, height matters, too. Since we already make Polycrete Big Block™ in 12”, 18” and 24” heights, we we thought you would want the option of mixing and matching panel heights on each block. We call it Polycrete Split Block™. So if you have a slab turning down into an ICF wall and you need 24” height on the outside of the wall and 12” on the inside, you don’t have to rip it in the field anymore. We can make that for you. Saves time. Reduces waste. Any concrete core width from 5-1/2” to 24” in three different heights that can be mixed and matched on the same block. It just keeps getting easier. The second innovation is Big Block Premium™. We’re now using BASF’s advanced technology Neopor polystyrene beads to give you the choice of a higher R value ICF. Standard EPS has a minimum R value of 4.00 per inch at 75 deg. F. BASF’s Neopor is nearly 15% higher, at 4.53 per inch. Tiny graphite particles added to the EPS act as infrared absorbers and infrared reflectors which greatly reduces thermal conductivity. That means the EPS insulation alone is at least R22.65 and an R30 wall is much easier to achieve. As always, the R values quoted here are minimum ratings under ASTM C518. Some ICF manufacturers may claim their products carry higher R-values than this. If they claim it, make them back it up and show you their test results. EPS thickness and it costs less than 20¢ more per square foot. Polycrete Big Block™ is a commercial grade insulated concrete forming (ICF) system. 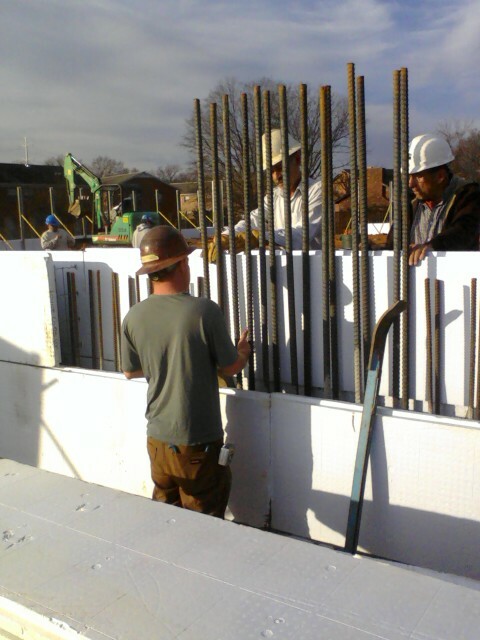 ICFs are forms for building reinforced concrete walls. The forms stay in place after the concrete cures and serve as insulation for the building. 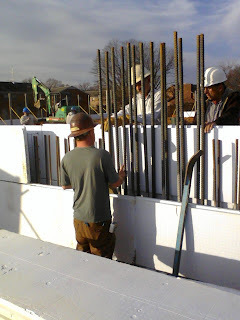 Sheetrock attached directly to the ICF on the inside and all conventional exterior finishes attach directly to the outside surface. Polycrete® lets you build faster , stronger and more efficient than traditional methods.